and thanks to everyone who came out to the farm for the tour and pop-up farm stand, it was an amazing day…. Hey everyone. Just a reminder about tomorrow’s tour, 10am-2pm, in the garden next to 665 28th street (pink house). Park on MLK or ride your bike. It’ll be sunny and there’s not much shade, so wear a hat. There will be no official tours, just little signs and things. At 15 mins past the hour, on the hour, I will give a little talk about the place and how it all works. To protect the privacy of my neighbors, I won’t be letting people in the backyard where the animals are kept, but will bring the goats and rabbits out into the garden. All things are in limited quantities, first come, first served. If, as the saying goes, “angels send meat, and the devil sends cooks,” butchers fall somewhere in between. The butchers I’ve known are centered, kind, hard-working people who know how an animal is put together. For farmers, they take up where we left off, and they are the intermediaries for the chefs, many of whom don’t work with whole animals anymore. April 26th poultry, May 24th sausage making. Same place, same time. See you there! We’re doing it again: the open farm tour, this Sunday, March 28 from 10am to 2pm. I’m not going to do tours like last time, there will be signs and stuff for a self-guided tour. That way I can have fun and talk to people! Might have a few items for sale like books (i can sign ’em) and t-shirts (only a few left). I’ll also have a clipboard and will be surveying people about what they’d like to buy at the pop-up farm stand, what days work for them, etc. If you want to get your hands dirty, bring a pair of gloves and you can help pull up some dreaded bermuda grass. 665 28th street, at Martin Luther King Way in Oakland. Bikes get extra credit, and if you do drive, park on MLK, not 28th Street. Thanks. I am so high on almost spring! 1. classes at the Biofuel Oasis urban farming store are going strong. 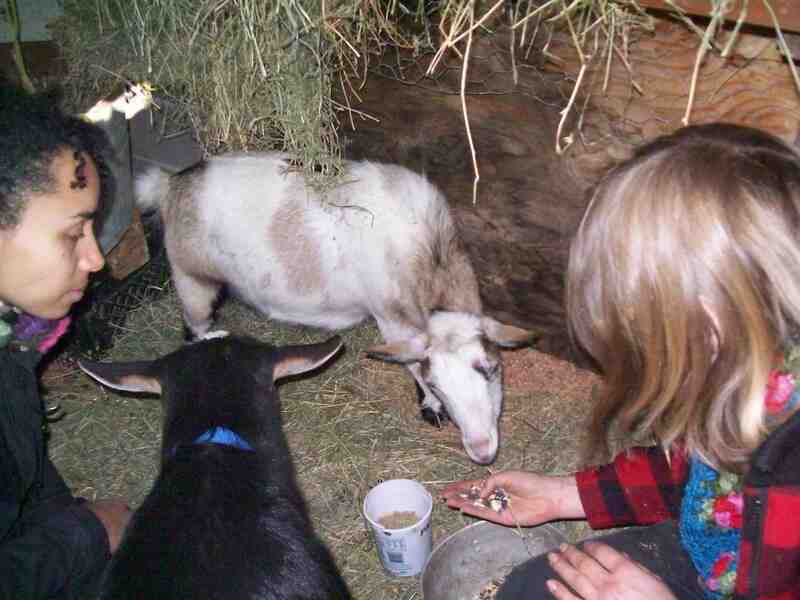 i’m teaching a goat class may 9th, that isn’t quite full yet. 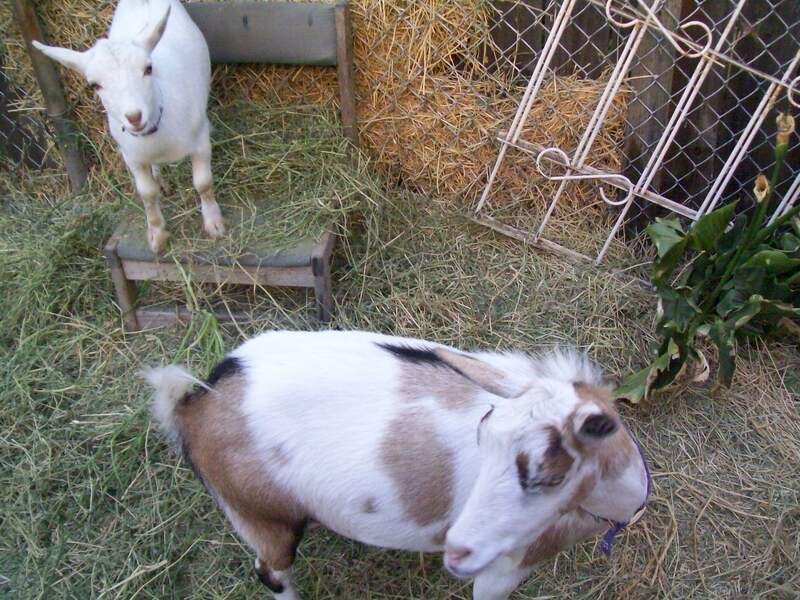 if you’ve been thinking about raising goats, sign up for this class! there’s also classes about rainwater harveting, greywater, beekeeping, and chicken raising. 2. the sf garden show, usually an over-the-top horticulture event, is getting into food crops. this year it’s being held in san mateo (not cow palace) from March 24-28. Here are my picks for food gardening events: Pam Pierce, doyenne of the dirt, Wed March 24 at 3:30; Rosalind Creasy, edible landscaping godmother, appears March 25, 1pm; and a fellow urban farmer Bill Thoness is talking about heirloom vegetables, Friday March 26, 3:30. here’s a link for the full seminar schedule. 3. i’m ramping up garden production and have a new business model. though i’m still going to feed my hungry neighbors, i need to find a way to pay for seeds and alfalfa, rootstock and floating row cover. so i’ve hatched a plan to have a Pop Up Farm Stand! here’s the general idea: every week, on say, a wednesday or thursday, i’ll post on-line what’s available to buy. this list will include fava beans, salad green mixes, milk (pet food only), rabbit meat, herbs, beets, seedlings, and grafted fruit trees. i might even dabble in selling some products like preserved lemons, dried tea blends, and cheese (aged and fresh). i’ll also have books and t-shirts for sale. on Friday i’ll open up the farm for a few hours for people to come by and get what they want, on a first come, first served basis. i’d love to hear what you think of the idea, and what you’d like me to grow or raise. I wrote an essay about milking the gorgeous but sometimes bratty Bebe for EatingWell magazine. You can read it here. And for the kind people who’ve written me to find out what the heck Bebe looks like, her she blows, pictured here on the first day I brought her home, with me and my friend Marg…. And now here she is, with one of her first kids, Orla, who now lives down the street and has kids of her own…. 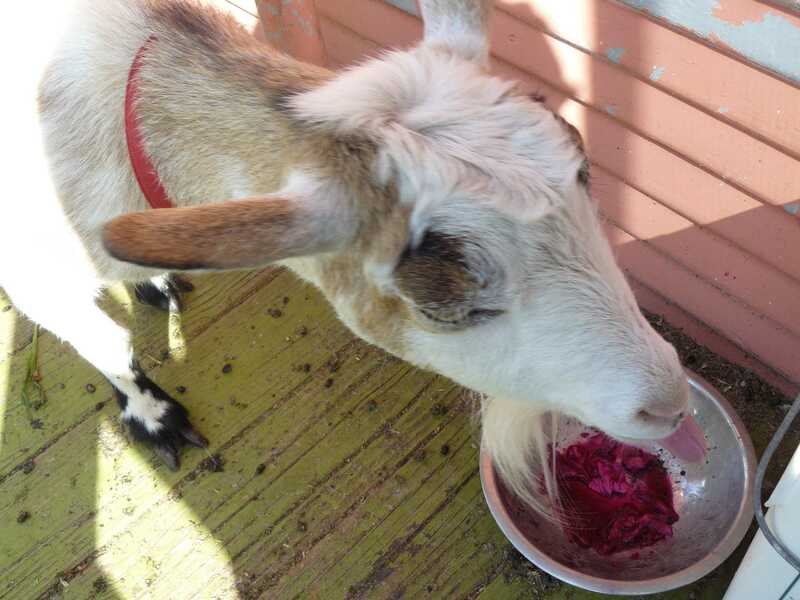 And here she is this morning, eating her kraut, which she loves. I didn’t weigh myself so I don’t know that I lost weight, but ghod, I feel so much lighter and stronger. This might have to become an annual almost-spring ritual. Did I learn anything? -Feeding yourself with homegrown food isn’t really that hard, you just have to have a bit of a stockpile of basics, and become creative with what you have. -Caffeine makes me who I am. Now that Bill’s back from Mexico, we’re going to clean out the cupboards with the catastrophe diet!